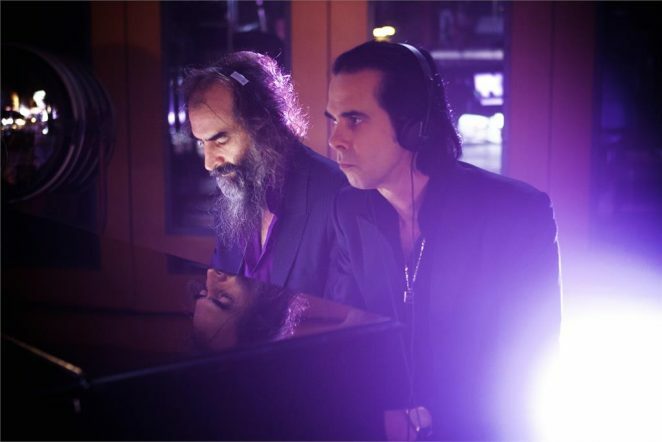 Nick Cave and Warren Ellis join the Melbourne Symphony Orchestra this August to perform a selection of suites from their highly distinctive film scores as part of the Melbourne International Film Festival. Conducted by Benjamin Northey, Nick Cave and Warren Ellis collaborate with the full symphonic sound of the MSO to bring music from The Proposition, The Road, Hell or High Water, The Assassination of Jesse James by the Coward Robert Ford, West of Memphis and Wind River to Hamer Hall. Cave and Ellis’ film scores are instantly recognisable for their minimal and hauntingly beautiful tones. Full of light and shade, creeping dread and inconsolable yearning, the heavily instrumental sounds inject humanity into the ghostly frontier towns, parched desert landscapes, post-apocalyptic war zones and extra-terrestrial vistas of their renowned films. The past 15 years has seen the duo compose both indie films and Hollywood features. Their first commissioned soundtrack, the brutal outback western The Proposition (2005) directed by John Hillcoat and scripted by Cave himself, introduced the widescreen compositions that would become their signature for future films. Big studio work beckoned in the shape of Andrew Dominik’s anti-western The Assassination of Jesse James by the Coward Robert Ford (2007). The eerie score underwrote the movie’s sombre mood and the lead character’s impending doom. Cave and Ellis reunited with Hillcoat for the adaptation of Cormac McCarthy’s highly successful novel The Road (2009). The artfully minimal score combined with mournful piano and clanging industrial percussion, enhanced the lurking malice. In 2012 Cave and Ellis composed a moving score for Amy Berg’s documentary West of Memphis about a controversial murder case in Arkansas. Returning to the American West, Cave and Ellis collaborated with David McKenzie for his masterful heist thriller Hell or High Water (2016), the score’s melancholy strains sounded as parched as the Texan visuals on screen. Wind River (2017) was a chilling murder set on a Native American reservation in Wyoming, delivering more orchestration and vocals into their usually spartan instrumental palette. Cave and Ellis delivered drama to the film’s wintry landscapes with rousing string arrangements, haunting choral chants and softly whispered cries. The Film Music of Nick Cave and Warren Ellis is proudly presented as part of the 68th Melbourne International Film Festival. Tickets on sale at 10am Thursday 11 April.